The conservative House Freedom Caucus, which Jordan founded, released a statement backing the Ohio Republican. 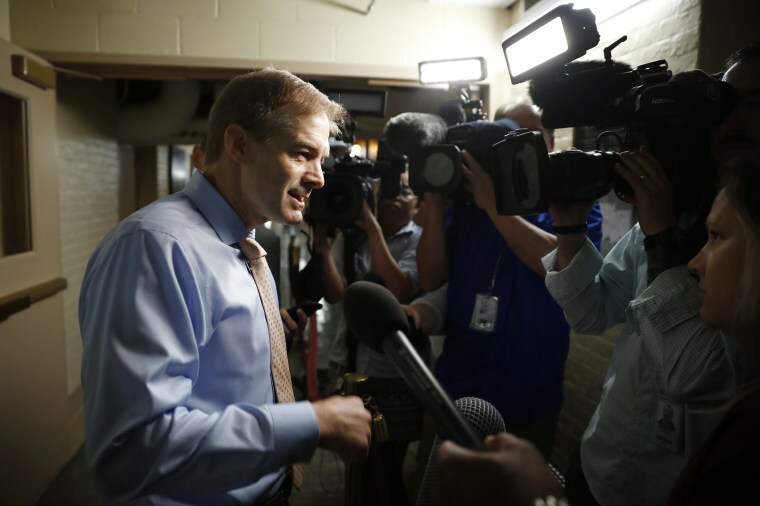 WASHINGTON — Speaker Paul Ryan on Wednesday joined a unified GOP front supporting Rep. Jim Jordan of Ohio in the face of allegations from some former wrestlers at Ohio State University that Jordan turned a blind eye to sexual abuse by the team's doctor. "Jim Jordan is a friend of mine," Ryan, R-Wis., told reporters. "We haven't always agreed with each other over the years. ... I've also known Jim Jordan to be a man of honesty and a man of integrity." Ryan said he had spoken with Jordan over the weekend when he checked in on him because Jordan's nephew, a wrestler at the University of Wisconsin-Madison, had died in a car accident. The speaker said he wants to make sure that "Ohio State conducts a review of this doctor and what he did, and that's important so that campuses are safe, and I'm glad that Jim is supporting that review." Jordan, who was an assistant wrestling coach at Ohio State, told reporters Wednesday that he's still working on scheduling an interview with investigators hired by the university who are looking into the allegations of abuse by the doctor, Richard Strauss, who has since died. Jordan continued to deny allegations that he was generally aware of locker-room talk about abuse by the doctor and that he had been specifically told of the doctor's conduct by one wrestler. "I am telling the truth," Jordan said. "I stood up to the speaker of the House from my home state, to the IRS and to the FBI. To think that I would not stand up for my athletes is ridiculous." The conservative House Freedom Caucus, which Jordan helped found, released a statement backing him Tuesday night, days after the allegations were first reported by NBC News. "Jim Jordan is a man of integrity, and we believe him and stand with him 100 percent. If he had seen or heard something he would have acted," the statement said on Twitter. Supporters have also launched a website defending the Republican lawmaker. Rep. Mark Meadows, R-N.C., the Freedom Caucus chairman, said Wednesday that he backs Jordan after knowing him for six years. "I know that he's a guy that fights for the underdog, always has," Meadows said. "And you know I've had a number of conversations with him and really at this particular point I know that if abuse allegations were brought up to him he would have been the first one to come to the defense." Meadows said that the allegations won't disqualify Jordan from being speaker if he chooses to run for the position if Republicans retain control of the House after the November elections. However, Rep. Kevin Cramer, R-N.D., who's running for Senate, suggested that the situation does complicate Jordan’s chances, though he prefaced his comment by admitting that he never viewed Jordan as a "very likely candidate for speaker to begin with." "I don't know how it could be anything other than complicated by it," Cramer said. "I think that’s fairly obvious."